Ensuring Academic Greatness Long-after Elementary School Soaring to New Heights at VVES! WINTER 2018 - IT SNOWED AT SCHOOL THIS YEAR! IF I RAN THE CIRCUS - THERE WOULD BE MORE OUTSIDE READING DAYS. 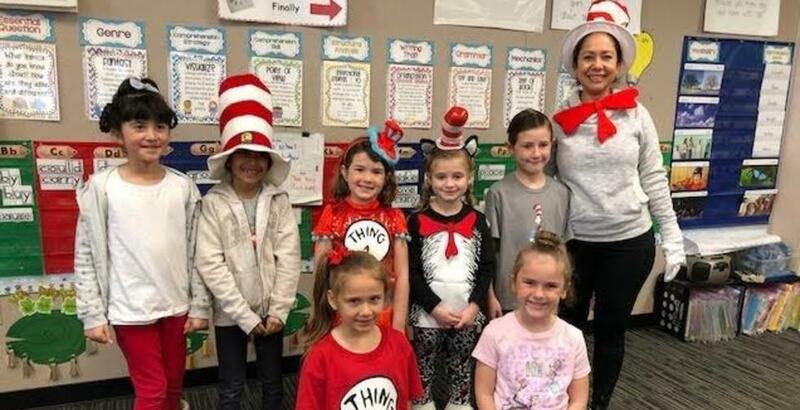 Valley View Elementary School (VVES) is one of 2 elementary schools (grades K - 6) within the Nuview Union School District, which is nestled in a low-lying valley in the eastern region of Riverside county. The school received it's name upon opening in 1991, as a result of recognizing it's spectacular views of the surrounding mountains (Lakeview, Juniper Flats, San Jacinto, San Bernardino, and Mt. Baldy-Los Angeles ranges). VVES has an enrollment of approximately 550 students. The school mascot is the eagle and the school colors are royal blue, silver, and black. We welcome visitors to browse the website to become more acquainted with programs and staff. Or better yet, please stop by for a site visit. EAGLE PRIDE! Yearbooks are a fun way to capture memories. The book contains classroom student composites as well as photos during fun activities and events that have occurred throughout the school year. Students have fun collecting signatures in their yearbook during the last 3 days of school. The 6th grade students have a special activity during the last week of school just to hang out and sign each other's yearbook. . .The cost of a Valley View Elementary School yearbook is $15.00. The final day to order the 2018-2019 yearbook is Friday, April 12th. You may place money in an envelope including the students name, teacher, and grade level. All envelopes are to be turned in to Ms. Debaran in classroom E6 or at the office. Checks are made to Valley View ASB. Each year, we tend to run out of yearbooks - plan to reserve your soon!